Easy Slow Cooker Recipes for Pork All Year Round! What’s better during summer than sitting outside, cooking up a great meal with friends and family and enjoying the nice, warm weather? There isn’t much we can think of that hits the spot quite like a great-tasting, perfectly-seasoned meal straight from your slow cooker, and when summer time rolls around, that meal for us, is pork. Slow cooker pork recipes are vast and full of variety, and we just can’t get enough! The best thing about these slow cooker pork recipes is that, no matter what you’re making, you can prepare and assemble it indoors, and then go outside and enjoy it with your loved ones. No slaving over a hot grill with smoke blowing in your face on a hot day. An added bonus is that your whole house will smell absolutely amazing with the essence of tasty slow cooker pulled pork, pork chops, ribs, and more. Best of all, when you’re craving these recipes any other time of the year, you have everything you need to bring the feel of summer back into your home and onto your plate. We sincerely hope you enjoy the recipes we’ve included in this free eCookbook, and can’t wait for you to share them with your friends and family. From the slow cooker to your table, we are sure these pork recipes will put smiles on the faces of all who are lucky enough to taste them. They might even become some of your newest go-to recipes for summer and beyond. These are the slow cooked pork recipes you need for those die-hard pork lovers in your life – you know who they are! Slow and Steady Wins in Taste! 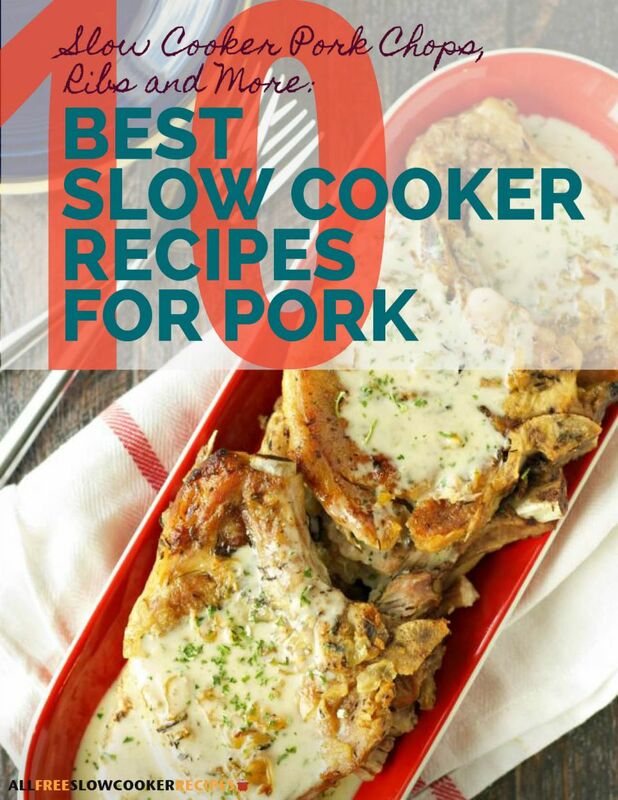 Download Slow Cooker Pork Chops, Ribs and More: 10 Best Slow Cooker Recipes for Pork today! What's Inside This Free eBook? Peachy Keen Glazed Pork Chops (shown above; Pg.7) - For a delightfully-fresh take on slow-cooked pork chops, try this Peachy Keen Glazed Pork Chops recipe. This recipe uses peach preserves for fresh peach-glazed pork chops that are unique and totally delicious. This recipe takes the great flavor of regular pork chops, and amps it up with a burst of sweetness that perfectly glazes each tasty chop. Southern Smothered Pork Chops (Pg. 11) - This is a wonderfully easy recipe for slow cooker pork chops that is guaranteed to get your mouth watering. This recipe uses super simple seasoning, yet gives you a succulent meal that will "wow" you. This is a great recipe to whip up during the holidays because of how elegant and hearty it is, but it's also a great dish to make when you're in need of something to throw together for a weeknight dinner. Four-Ingredient BBQ Ribs (Pg. 14) - This slow cooker pork tenderloin recipe will make you rethink the way you cook BBQ dishes from here on out. The pork loin ribs marinate in a mixture of pineapple juice and brown sugar to give these easy slow cooker ribs a sweet flavor. After they are done cooking, throw them on the grill and slather with your favorite BBQ sauce. Country-Style Slow Cooker Pork Roast (shown above; Pg. 16) - Make this slow cooker pork roast for special occasions or casual weeknight dinners. Either way, it will be a treat for the whole family. This recipe is great because you can make it any time of the year. The most delicious part, is the thick and creamy gravy that goes on top. Apple-Spiked Pulled Pork Recipe (shown above; Pg. 20) - This recipe shows you how to construct a whole sandwich with a tasty apple flavor and a side of almond-apple coleslaw. You'll love the fresh burst of flavor combined with juicy meat in this pulled pork slow cooker recipe. Easy slow cooker recipes like this one give you a perfect meal every time, and you don't even have to work that hard to get it. Slow Cooker BBQ Pulled Pork (Made in our Test Kitchen; Pg. 23) - Simply made with salt, pepper, garlic, water, and barbecue sauce, it's a tasty dish that you can leave to cook all day. You'll love how easy and flavorful this pulled pork slow cooker recipe is, and how handy it comes in when you're in the mood for pulled pork sandwiches or tacos. If you enjoyed this free eBook, you won't want to miss any of our other downloadable recipe collections. You can browse our entire library of free e Cookbooks here. Chances to win cook books and other exciting products from our weekly giveaways and contests. New, FREE recipes made available to you throughout the year. Access to our recipe library full of hundreds more free recipes.